Successfully Added 2 DIN Car Stereo VW Passat - 9-Inch HD Display, Android 8.0.1, Bluetooth, WiFi, 3G&4G Google Play, CAN BUS, Octa-Core CPU, GPS to your Shopping Cart. 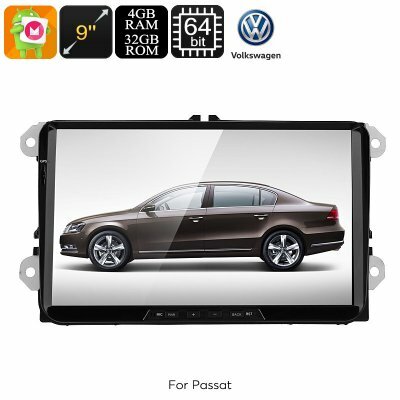 Bring the latest Android feature into your Volkswagen Passat with this 2 DIN car stereo. This easy to install car accessory is guaranteed to bring both efficiency and entertainment into your vehicle. With its Android 8.0.1 Operating System, it allows you to download games, movies, and Apps through the Play Store. All these media can be enjoyed at any time on its stunning 9 Inch HD display. Your car media player packs an Octa-Core processor that has been clocked at 1.2GHz and 4GB RAM. With this hardware, it is capable of tackling the latest Android applications and media files without dropping a frame. Like any high-end two DIN stereo, this car gadget features an accurate GPS navigation system. With this 20-channel car navigator, you’ll always be treated to highly accurate information regarding your position. From now on, you’ll be able to drive from A to B without ever needing to worry about getting lost again. Large and annoying maps will be an annoyance of the past. This navigation system will lead you to your upcoming destinations in the fastest and most efficient manner. All you have to do is insert the Android map of your liking, and you’ll be ready to go. In order to increase its usability even further, this Android car media player supports both WiFi and 3G connectivity. Thanks to this, you’ll be able to browse the web at any time. Therefore, you can stream movies, download media, and make online calls to friends and family. Besides all its high-end features, this car stereo naturally also supports regular AM/FM radio frequencies. Additionally, it lets you listen to MP3 and MP4 files. With Bluetooth support, it even allows you to synchronize it with your smartphone so that you can listen to songs from your mobile music library. Its microphone furthermore brings along the possibility to engage in hands-free calls to increase your safety on the road. Arabic: - استريو السيارة الروبوت - Chinese Simplified: - 安卓汽车音响 - Czech: - Android autorádia - Danish: - Android bilstereo - Dutch: - Android autoradio - French: - Autoradio Android - German: - Android Auto-Stereoanlage - Hebrew: - מערכת אנדרואיד - Hindi: - एंड्रॉयड कार स्टीरियो - Italian: - Autoradio Android - Japanese: - アンドロイド カーステレオ - Korean: - 안 드 로이드 자동차 스테레오 - Malay: - Stereo kereta Android - Norwegian Bokmål: - Android bilstereoen - Romanian: - Android auto Stereo - Russian: - Андроид стерео - Spanish: - Autorradio Android - Thai: - เครื่องเสียงรถยนต์หุ่นยนต์ - Turkish: - Android araba Stereo - Vietnamese: - Android xe hơi âm thanh Stereo.